The OMNI Family of tractor implements and accessories helps you maximize your compact or sub compact utility tractor's potential. The OMNI 2300 Combo is designed and built especially for the John Deere 2300 Series of sub compact tractors. It has all the same superior craftsmanship and materials of our other hitches but on a smaller scale. The OMNI 2300 Combo Hitch transforms your tractor's 3 point hitch into a universal trailer hitch platform. You can use your trailer hitches and accessories from your truck or auto receivers. 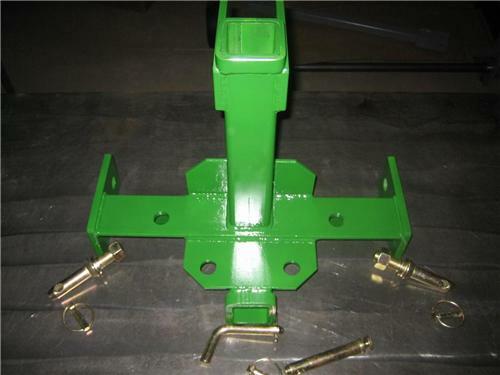 The 2" receiver hitch is a universally accepted method for trailer transport and many other trailer hitch items. The OMNI 2300 Combo Hitch is ruggedly built using a 3" x 3" x 3/8" H.R. angle Main Draw Bar with a square tube trailer receiver supported by 1/4" fish plates welded to it. There are 2-1" holes to attach addition balls, hooks, clevises, etc. The vertical member is a 2 1/2 "x 2 1/2 "x 3/16" square tube with a reinforced end. We use a durable long lasting Premium John Deere Enamel paint to top it all off. Please shop around and compare. OMNI Mfg is confident that the high quality and competitive pricing of our product will stand out as the best value in it's class. This item includes 20" wide Category 1 OMNI 2300 Combo Hitch with two 7/8" lower link pins, one 3/4" top link pin and one 5/8" hitch pin included. Please verify that your tractors lower link arms will accommodate the 20" width of this hitch.Some pictures show other OMNI Hitches and Accessories and these ARE NOT INCLUDED.